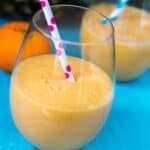 Persimmon pineapple orange smoothie – a combination of healthy fruit blended with coconut milk into a smooth consistency. 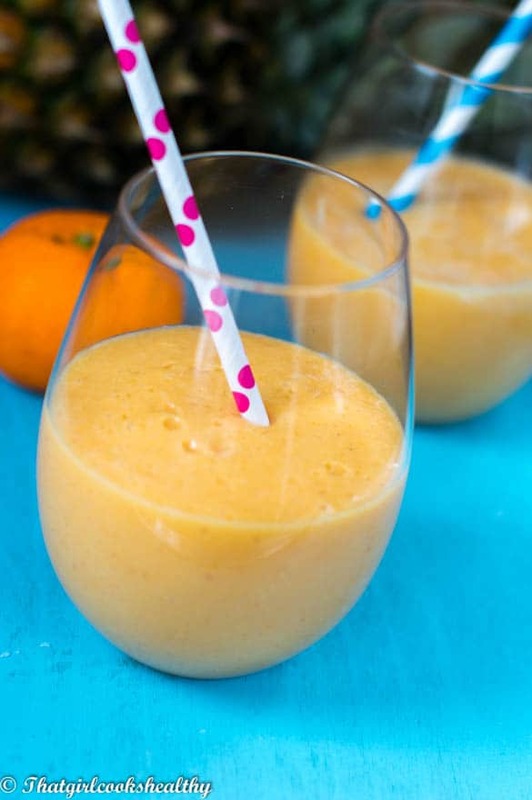 What do you get when you combine a over ripe persimmon with some sweet fresh pineapple, a zesty orange and let’s not forget some coconut milk?….any guesses? You’re greeted with a heavenly non alcoholic fruit cocktail. Today folks is smoothie Sunday with your co-host Charla, yes that’s right I’m giving the solid, cooked food a rest, but I have every intention to persevere with cooking on Monday onwards. Do you know what’s so fun about smoothie making? What I enjoy the most is the ability to be creative with just about any fruit or veg. While I have my favourite masterpiece smoothies, you know those awesome combinations that you often defer to? The truth be told, I’m a certified creative young woman – always yearning for a new smoothie flavour. Persimmons are a favourite fruit of mine, but sadly the supermarkets are beginning to withdraw large quantities from the shelves, in a bid to replenish old stock with post winter fruit, it’s the same thing with the green groceries. Thankfully, my luck has extended to sharing this wonderful recipe with my readership. I love sharing recipes that nourish the body and this smoothie surely meets the criteria. 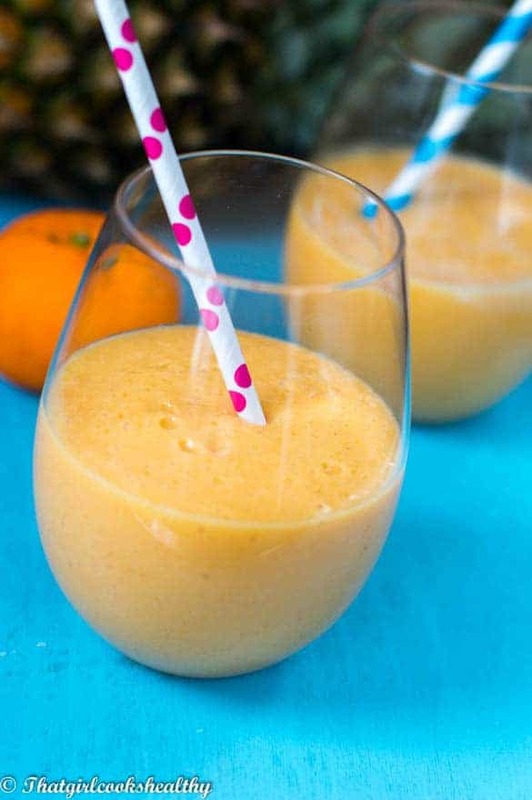 This persimmon pineapple orange smoothie is packed with enzymes to aid digestion (thus allowing food to absorb and break down) in it’s entirety and anti inflammatory properties where the white blood cells are able to ward off any antigens (foreign invaders) and keep the immune system healthy. 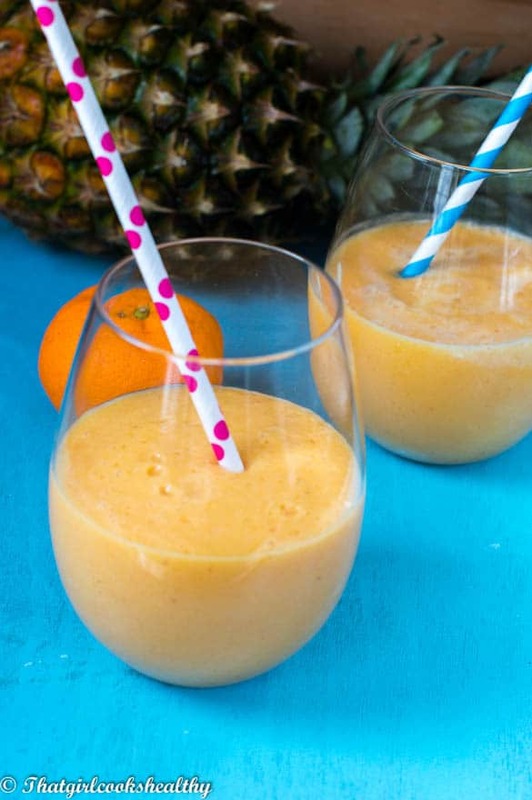 I don’t know about you guys but this strengthening smoothie is the type I’d like to gulp down on a regular basis. Whose with me on that one? Any show of hands? Sweet, zesty, yet good for the body! 1 large persimmon, over ripe almost bursting. 1/3 cup of fresh pineapple, tightly packed, cored and peeled. Add all of the ingredients to the blender and whiz until a smooth consistency is present.